The nautical rapper stopped by Ebro in the Morning and freestyled a little bit. 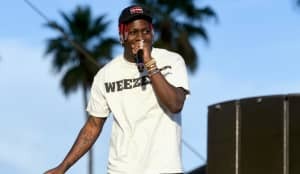 Lil Yachty sat down with the Ebro in the Morning crew for a rapid fire interview that covered a crazy array of topics. The Atlanta nautical enthusiast told the hosts that he spent two months in college at Alabama State before realizing he hated it because no one jived with his outsider persona. "Everyone there was like 10 years behind. They just hated me," he said. Even he doesn't know how to classify himself saying that he's "not a rapper," and not a "rock star," even though his high energy shows would prove otherwise. He also revealed that cinnamon Pop Tarts were his favorite flavor. Though Yachty told the crew he "never freestyles" he still drops a verse at 26:15 but has to keep restarting because he can't take the pressure of Peter Rosenberg hyping him. It's pretty endearing.